Despite this claim, we sincerely hope you are considering buying their dog food for your dog and not yourself. 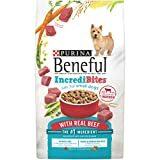 If so, we will help you choose the best Honest Kitchen dog food, by reviewing and comparing some of their top products. HUMAN GRADE: The Honest Kitchen meets the rigorous FDA safety standards to use the label 'human grade', ensuring the highest quality dogs treats. ALL NATURAL: This all natural treat contains no glycerin or fillers, just three simple ingredients to make a deliciously chewy and satisfying treat. We all know how much cats like to eat fish-flavored food and treats, but have you ever thought about how much your dog might enjoy fish too? Even better, if it was a chewy treat full of healthy, and natural goodness they are bound to love it. Honest Kitchen Beams are as close to a 100% natural product as you can get as they consist entirely of only one ingredient – fish skins. The skins come from a variety of sea-caught fish, and only from sustainable sources so that there is no negative impact on ocean stocks. So now you know that fish stocks will remain healthy, let’s look at how these beams also have a positive effect on your dog’s health. The first and the most obvious point is down to there being no additives or artificial ingredients of any kind used to make these treats. That means no chemicals or any other unnatural substance which might cause an adverse reaction in your dog. The fish treats contain high levels of Omega-3 fatty acids, which have anti-inflammatory properties, so they can limit conditions such as arthritis, allergies, and skin irritations. Omega-3s also promote shiny, healthy coats, so your dog will shed less, and look great. One of the primary benefits of dogs being given chews of any kind, but especially with this product, is the boost it gives their oral hygiene. 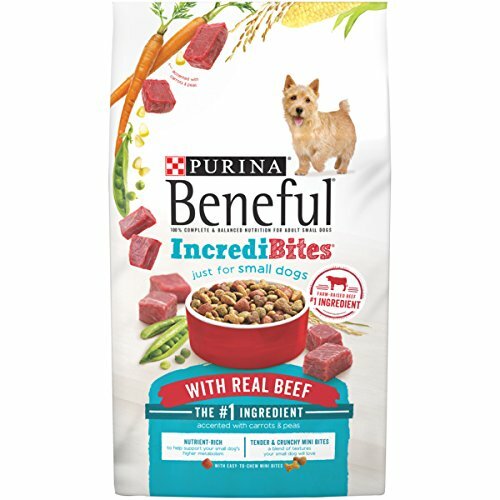 Honest Kitchen beams will act like your dog’s very own toothbrush as it helps to clean teeth and promotes healthier guns as they gnaw their way through the treat. 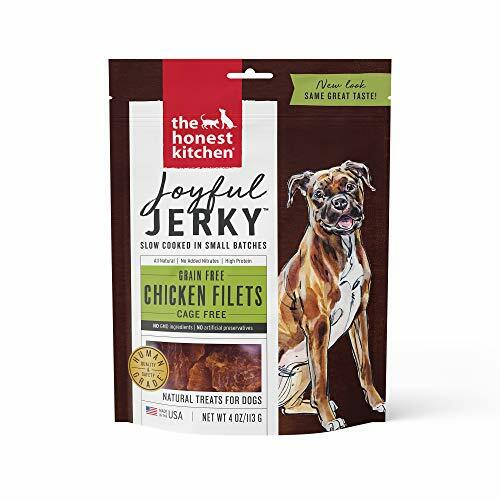 All dogs love treats and most also like the taste of chicken, so when Honest Kitchen combined both facts to create their Joyful Jerky Chicken Flavored Treats, they must have known they had a winning combination. 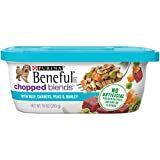 Chicken is one of the most popular flavors when it comes to dog food and treats, but unfortunately in many products that flavor is artificially created, so although the dog enjoys the taste, they are getting none of the nutritional benefits they would receive, were they to eat real chicken. Thankfully the people at Honest Kitchen have used nothing artificial in these treats, which are made with real chicken breast. 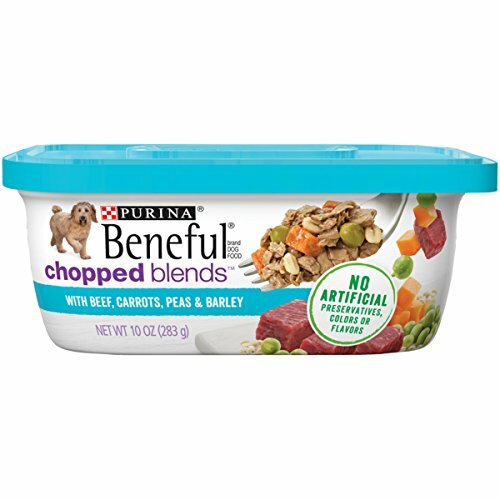 This means there are no fillers, artificial colors or flavors, and no glycerin which you often find is one of the ingredients of inferior dog foods. The nutrition which your dog receives from eating chicken comes in many ways. The main one is that it is very high in protein, which is a primary part of ensuring your dog’s muscles, and other body tissue is kept in the best of health. This includes repairing tissue and muscles should your dog be unfortunate enough to have suffered that type of injury. High-protein chicken also provides energy which every dog needs plus it helps to keep your dog’s immune system strong, to ward off infections or illness. 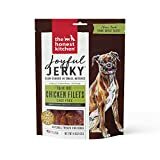 These jerky treats come in fillet sized pieces, so they are ideal for medium or larger dogs; however, if your dog is smaller, the same delicious treats are also available in bite-sized pieces. Whenever the Christmas season comes along, one of the best, and most delicious traditions, is drinking eggnog. Now, instead of them being left out of the fun, you can now invite your dog to join in, with Honest Kitchen’s Instant Eggnog. 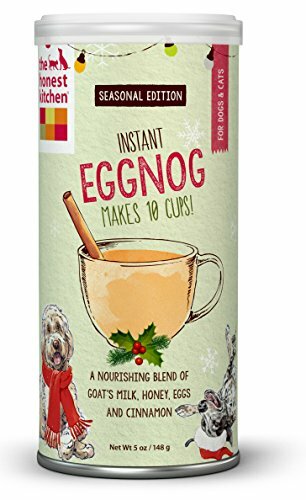 Honest Kitchen, as they often do, have decided if its good enough for the dog owners, then the dogs should have some too, and so here we have eggnog for dogs. This product comes in powder form, and to make your dog some eggnog you simply add two tablespoons to a cup of hot water and allow it to cool. Depending on your dog’s body weight, pour an appropriate amount into your dog’s drinking bowl for them to enjoy a delicious, and nutritious drink. Alternatively, you can pour over their food to add additional flavor too. The eggnog’s ingredients are dehydrated goat’s milk, dehydrated egg, dehydrated honey, and some cinnamon, and if that list hasn’t got your mouth watering, what will? There is also a high nutritional value to the eggnog, as it is high in proteins which help keep your dog’s body tissue and muscle in tip-top condition and help them to fight off any infections which might be lurking. Having said that, it is not designed as the only nutrition your dog receives nor should it be given it every day. Instead, see the eggnog as supplementary nutrition and more importantly, a tasty treat which your dog will love. Think of the fun around Christmas time when everyone else at home is drinking eggnog and instead of boring old water, your dog can enjoy a festive bowl of eggnog too. Even better, why not put it in their stocking as a unique Christmas gift. Having a ready supply of treats for your dog is always helpful, whether that is part of their training or simply to reward them when they have been good. Of course, cookies are an absolute favorite treat for dogs and Honest Kitchen’s Nuzzles will be no exception to that. When you see these treats, you might wonder why they are not simply called cookies, instead of ‘Nuzzles.’ Do you know what a ‘nuzzle’ is? It is the word used to describe the action of a dog gently pushing and rubbing its nose against someone, who in most cases will be their owner, although they will also do it to greet other dogs they like. Nuzzling is an act of affection from your dog and this is a theme which is very apparent with these treats. Affection or even love is also clearly in the air when you see that the bite-sized cookies are all heart shaped. So, whenever your dog has been good for you, or you simply want to say you love them, you can give them a heart-shaped nuzzle treat. We know love goes into these treats, but we also want to look at what ingredients go into these treats too. They are all natural, and the main ones in terms of flavor are duck and cherries. There are also eggs, organic coconut oil, and even some parmesan cheese. The cookies are neither too hard, nor are too crumbly so they will be suitable whether you have a large dog who will scoff them down by the dozen, or a small dog who will nibble a single treat. Given that they are low in calories, there should be no adverse impact on your dog’s weight. Trying to choose the best Honest Kitchen dog food from the treats we looked at was very difficult, simply because they are all extremely nutritious, undoubtedly delicious and made from only natural ingredients. However, there was one that stood out because it was a little bit unusual and a lot of fun, and that is The Honest Kitchen Instant Eggnog. It is great when a dog food company dares to be different, and by creating this eggnog, Honest Kitchen has done exactly that. It is nutritious, delicious, and can be used either as a stand-alone drink, or added to food. More importantly, it will make a great gift for your dog at Christmas time, and then they too can join the family in an eggnog toast. Cheers!